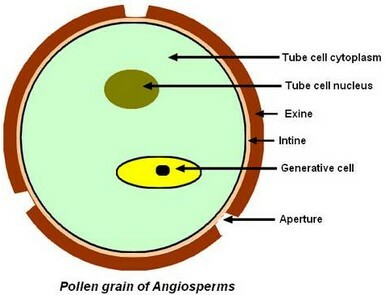 The pollen grain of pollen is generally made of only 2 haploid cells: – The tube cell, responsible for the elongation of the pollen tube, – The generative cell that will give 2 male gametes or sperm cells. The pollen grain is surrounded with 2 walls: – The exine, thick, ornamented or smooth, – And the intine, fine and doubling inside the exine. In certain places called apertures, exine is thinner and intine thicker. In the pollen of Monocots or Basal Dicots, there is normally only one aperture, circular or furrowed. Sometimes, this aperture stretches, being thinned by places it then gives several pores. In the pollen of true Dicots (Eudicots), there are normally 3 apertures. However, this number can vary and be multiplied.